A semantically annotated parallel corpus for English, German, Dutch and Italian! 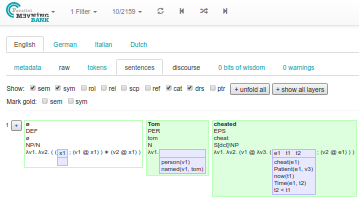 The Parallel Meaning Bank (PMB), developed at the University of Groningen and building upon the Groningen Meaning Bank, comprises sentences and texts in raw and tokenised format, syntactic analysis, word senses, thematic roles, reference resolution, and formal meaning representations. The main objective of the PMB is to provide fine-grained meaning representations for words, sentences and texts. Sentences are, in isolation, often ambiguous. In the PMB we aim to provide the most likely interpretation for a sentence, with a minimal use of underspecification. The current (development) version of the PMB is accessible via the PMB Explorer. You are welcome to contribute to the PMB by providing corrections to existing linguistic annotations in a wiki-like environment. Anyone can register via the PMB Explorer and check, improve, or discuss linguistic annotations. Released data can be downloaded from the data page. The PMB is developed at the University of Groningen as part of the NWO vici project "Lost in Translation -- Found in Meaning" (Project number 277-89-003), led by Johan Bos (2015-2020). The logo for the PMB was designed by Sara Bárcena and Valerio Basile. On special occasions the PMB is decorated with special logos, for instance this logo designed by Lasha Abzianidze for introducing a special Christmas feeling.